VANCOUVER — There’s never a shortage of candidates when you want to compile the toughest coaching jobs in hockey. But in the last month, you could easily add one non-head man to the list: goaltending coach for the Buffalo Sabres. That’s Jim Corsi. He’s had it pretty good for many years. It was Ryan Miller and a slew of backups who played every once in a while as Miller toiled 60-70 games a season. Oh, how things have changed. The Sabres had one stretch around the Feb. 28 trade of Miller where they had five different backups in five games because of trades, a revolving door of Jhonas Enroth, Miller, HarborCenter employee Ryan Vinz, Jaroslav Halak and Michal Neuvirth. They nearly had a stretch last week of four starters in four games as injuries took down both Neuvirth and Enroth. That has forced the Sabres to go with the direct-from-Rochester tandem of Nathan Lieuwen and Matt Hackett on their longest road trip of the season. The Sabres are 1-2 so far on the trip, which continues tonight in Montreal as Hackett gets his second start since getting the emergency recall from the Amerks. They were off Monday so they could make the long flight East. Miller was having one of his best seasons while playing for a last-place team but even without him, Buffalo’s goaltending has certainly not taken a major nosedive. An anemic offense is largely responsible for the team’s 3-9 record since the trade, as it has scored just 20 goals in the 12 games. At the other end, the quartet of goalies has combined for a 2.46 goals against average and solid .934 save percentage — which is actually better than the .916 Miller has posted with the Blues. Miller has a 7-2-1 record for St. Louis with a 2.03 GAA. Sunday’s loss, where Lieuwen gave up a couple of soft goals, was really the only time play in the crease has been an issue. Corsi, 59, feels good about Lieuwen and Hackett as prospects. 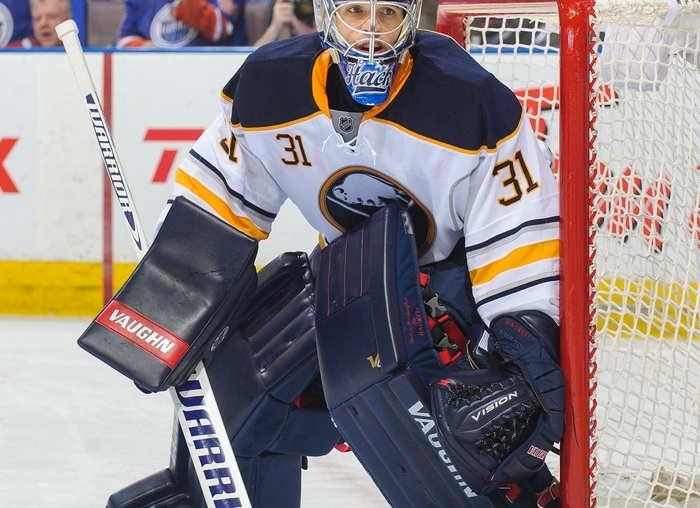 He likes how Lieuwen plays a “quiet” game in the crease despite being 6-foot-5 and how Hackett flushed aside some of his struggles this year in Rochester to make 35 saves in his first Buffalo outing Thursday in Edmonton. “There’s a little less structure in the American League and young kids want to be good in the worst way and in a hurry to be better,” Corsi said. “If you were to look at it strategiclly, goaltending is a job that you have to develop mental strength and technical skill — and marry it with tactical skill. It takes time. It’s been a wild year for Corsi. Just last month, he was listed at No. 95 on annual top-100 list of People of Power and Influence in the game by The Hockey News. That’s because he developed the “Corsi rating”, an analytic measuring shots on goal plus shot attempts that has become much more mainstream among hockey observers in recent years. Miller was intrigued by Corsi’s thought processes and the two developed a close relationship. Corsi knew Miller’s time here was nearing an end but that didn’t soften the blow any when the deal was finally announced. On the night he was traded, Miller was understandably emotional about his sudden departure. He admitted he was struggling to find words to match his flood of thoughts. But Miller had no trouble remembering to thank one person. It was Corsi, whom he called more than just a coach during his time in Buffalo. Between his playing career and coaching career, Corsi was a high school math and science teacher in Quebec. He said watching Miller’s emotional good-bye made him think of reunions with some former students. After all, the athlete-coach relationship can certainly be similar to teacher-student.